The CVS range is suitable for harvesting Wheat, Durum, Barley, Oats, Flax and other small grain crops. 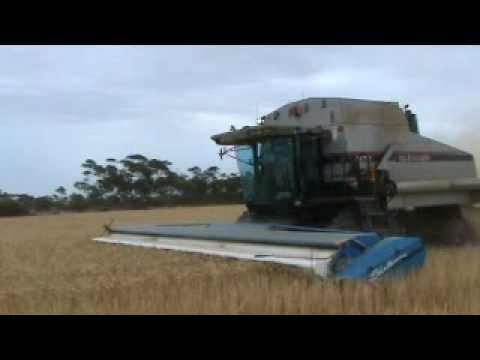 The CVS Stripper Header's unique stripping action simply strips the grain from the heads, feeding just the grain and a little chaff into your combine, increasing harvesting speed, reducing fuel consumption and greatly reducing wear on your combine. The stainless steel "Seed Saver" stripping fingers are orientated with the cups facing upwards for wheat, this gives more aggressive stripping which is essential for certain tough threshing wheat and durum varieties. As on the RVS and RSD 8 rows of fingers are used on the rearwards rotating rotor to strip the grain from the heads and feed it back into the auger. (Guards have been removed for illustrative purposes only). All Guards must be fitted before use. A monitor is fitted in the combine cab which allows the operator to adjust and display the rotor and auger speed. The monitor has inbuilt alarms to notify the operator of problems, this is critical when harvesting in particularly tough conditions. Spring stainless steel flange tipped fingers give increased wear resistance as well as providing a more aggressive stripping action. The fingers are orientated with the cups facing upwards to aid in stripping hard threshing varieties. These cups also contain the grain and control its trajectory as it moves through the header. Variable speed belt drive allows the operator to adjust the rotor speed using a cab mounted switch to compensate for changing field conditions. It is common to start in the morning at a fairly high rotor speed when conditions are damp and tough, then slow the rotor down as the crop dries out and then speed it up again in the evening as harvesting conditions toughen. 24 foot and wider headers are offset to the right to compensate for the heavier left end of the header. This makes levelling the header on the feederhouse easier. The use of a stripper header provides the average combine with 30% to 100% additional harvesting capacity. The stripping action delivers just the grain and no straw to the combine which improves productivity and reduces losses. 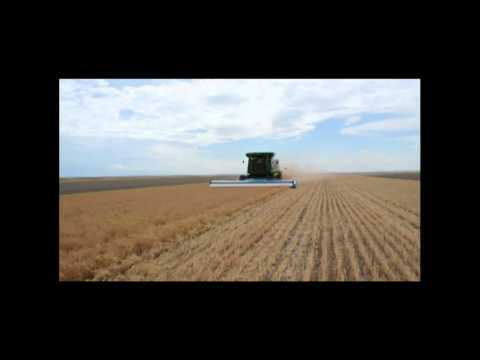 Here the Soya Bean planter can be seen operating immediately behind the combine in Indiana, USA. Experience has proven with local farmers that for every days delay in planting there will be a consistent reduction in bean yield. Here the young soya bean plants are seen growing up through the stripped straw. Because of the rearwards rotation of the stripping rotor it is able to pick hailed and lodged crops up off of the ground. Under such conditions straw intake is kept low and so both productivity and crop recovery are both significantly improved. Rather than leaving the field shaven bare as with a conventional header a stripper header leaves standing residue. This standing straw has tremendous conservational value in arid areas. Moisture conservation through snow trap and ground shading have come to mean the difference between a successful crop and a failure for many farmers. Standing straw provides an ideal no-till planting environment and is often utilised when in a wheat, corn, fallow rotation.